Can you confirm these amateur observations of Liolaemus velosoi? Type locality: “Desvio Cerro Imán près de Copiapó (27° 20’ S-70° 30’)". josephorum: N Chile (Atacama region); Type locality: Diego de Almagro (26° 23’ S. 70° 02’ W, 750 msnm). Comment Synonymy: PINCHEIRA-DONOSO et al. 2008 synonymized josephorum with velosoi, a decision that is not supported by LOBO et al. 2010 (although the latter do not list the species in their list! ), but confirmed by TRONCOSO-PALACIOS & FERRI-YÁNEZ 2012. Synonymized with platei by Demangel 2016. 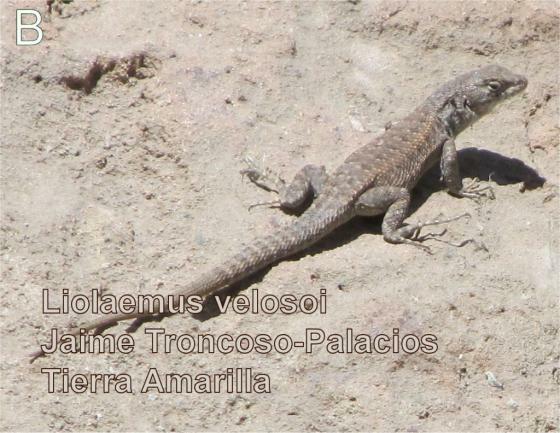 Etymology Named after Chilean herpetologists José Navarro and José Yáñez.